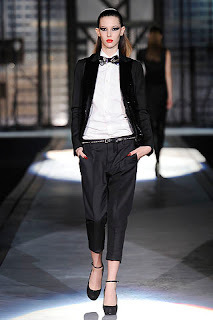 I love Dsquared. I always have. Not as much as Tom Ford, Lanvin,Versace but I still do love them. It is the return of the Vamp in the autumn /winter 2010, with the vibrant red lip, fur and a colour palette of black white and red. It's the return of the Femme Fatale!